We’ve all been wondering what kind of direction WhatsApp would take following its massive $19 billion acquisition by Facebook. And it appears taking an even greater threat to services like Skype and Viber are part of its immediate plans. 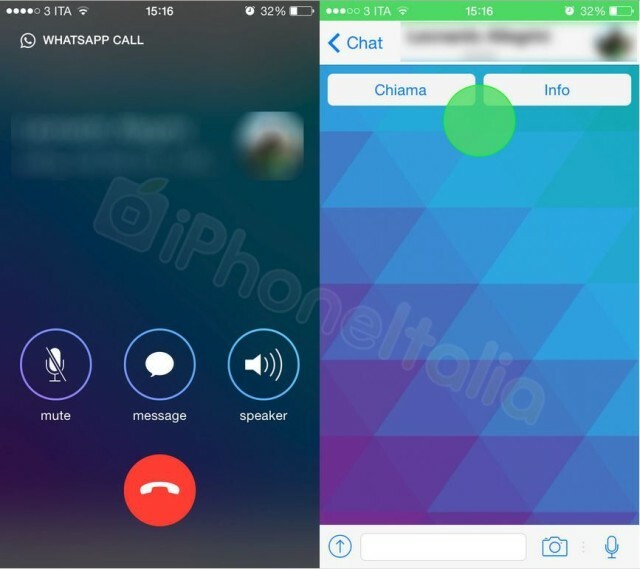 These images, published by iPhoneItalia today, show a new “WhatsApp Call” feature that will presumably give users the ability to make free voice calls to their friends. Given the size and popularity of the service — it now has more than 450 million users — many have wondered why WhatsApp hasn’t offered this feature already. It doesn’t like like video calling will be included initially — though you can bet it’ll be added later on — with just a few options to choose from in the calling screen. Users can mute the call, put it on speaker phone, and send instant messages while they talk. In addition to VoIP calling, the WhatsApp beta has a new camera located above the keyboard that allows users to quickly snap images from within conversations. It’s unclear when the new WhatsApp update might be available to users, but based on the time it took for WhatsApp to rollout its iOS 7 design refresh, we’re guessing it could be a while.